Mark Chapman returns with Osi Umenyiora and Jason Bell for an NFL season highlights review in the lead-up to Super Bowl 51 in Houston, Texas. Browse content similar to Championship Review. Check below for episodes and series from the same categories and more! It'll be time for these two teams to settle it. Elway, he's going to fire towards the end zone. will be in the big show. I'm telling you, it's real! No one ever stops us but us. We're not doing it today. One more means an NFL record. There we have it, then. who will only be appearing in their second ever Super Bowl. against a team with too much offensive exuberance to care. I'm here once again with Jason Bell. What did you make of last weekend? Thank you for that introduction! We saw some serious offense. Those two teams had some serious offense and they lit it up. What surprised you about either of the two games? Yes, both of those teams. the coaching staff is doing a good job with eliminating those mistakes. Were you surprised both games were quite so one-sided? You know, I was surprised. but that score really surprised me. I'm going to have to talk to him, won't I? We need to include him. I mean, what do you want me to say? What do you want me to say, Mark? as you know, I am the greatest! Did the margin of victory surprise you? In both of those games. they wanted to do, was a big surprise to me. but Atlanta versus Green Bay, definitely. and that is on the iPlayer. in next week's Super Bowl. at their disposal and they cared not for the Packers' Hollywood tale. They're going to move to the stadium just next door. Do you think that had an effect? You have played in this venue. From watching the game, that stadium was always like that. with that, that is just the way the city is. we focused on the sheer brilliance of Aaron Rodgers. Do you think they were intimidated? ran out of that match that they had going on. And you have to give Atlanta some credit. there and do anything to you. You dictate what you are going to do to him. And they did a good job with that. the ball, as you saw there with that touchdown. Yes, he can do it all. He is a fantastic quarterback. the ability to do that so far. Although it does help, the weapons that are at his disposal? He has numerous go-to guys? to think, is it my star guy? He knows that guy can do a job and win that. is, as we see there, he is their star wide receiver? He is Matt Ryan's number one go-to guy. and they aren't that bad an option? That is kind of what you are saying? There is always a one-on-one matchup that the offense wants to go to. And he is confident in that guy, whoever that matchup is on his team. But they have the X-factor in Julio Jones. They have a guy who can do it all. Tom Brady would in New England. That is an outstanding offense, that will be very difficult to stop. We will focus more on Ryan and Julio Jones in just a moment. tried to run the table? the back of his neck. with broken ribs to play. the Atlanta Falcons smacked him! He transferred that into Jordy Nelson. It's not because of Jordy Nelson, man, come on! Everybody gets hurt in the NFL, it happens! You are not buying it? He was crying because it got smacked around! let's deal with them in more depth. Matt Ryan is favourite for MVP, isn't he? Yeah, I would think so. it is because he has got the ability to spread that ball around. focused on a lot in this show? to know about this man. calm and collected under pressure. Do you think that is a good nickname, by the way? I think it's a great nickname! there is ice water running through his veins. Yeah, he's everything you would want in a quarterback. As far as him being the MVP, no question about that. He is the best player on the best offensive football. what should they look out for with Julio Jones? in the entire NFL on display. He is one of the best. Who would you say is a better athlete than Julio Jones? Somebody definitely who plays quarterback! Jason always loyal to his position! Got to stick with what I know! and try to be physical with him,? He will out physical you. If you try to play bump-and-run on him, he will run past you. and get it over you. the New England Patriots are going to deal with him. about their offense at the moment. you praise Atlanta's defense as well for what they did to Green Bay. was able to do against Green Bay. They are just like Seattle's defense, right? Fixed it up tight and you see how they played. winning your conference can often be forgotten. Here are the Falcons celebrating that achievement. Most years you go home disappointed. This year, I am one game away. I don't really know what to say or think. I just want to hug all my team-mates, you know? Because we put all the work in, we grinded all year. As a kid, it's something I always dream of. And to see it come to fruition, I cannot express in words right now. I'm a little speechless right now! But, you know, the brotherhood is the main thing. and fight for each other, the sky's the limit. been to a Super Bowl. This will be a mental battle as much as a physical one. others are trying to knock it off. You ever been in front of a pro boxer before? I'm the speed guy, I'm about speed. In NFL you guys got to be quick. That's great in boxing, too. You're always around, always moving. It's a very mental game. It is tactics and strategy. In football it is a lot of the same thing. into the preparation of the game. Before a fight the guys have to be the same weight. After the weigh-in, you weigh in and you square up with your man. You look at each other. I'm not going to box, ever! You've got a little bit of fire in you. Come together, let's see it. I told you, I warned you. What you got, J Bell? That is definitely against the rules! You seen me connect with that overhand left? We can do it again. You have that look in your eye. Is that just the way you are all the time? Or is it once you step into this arena, you've got that...? Is it because we are in here? You have a little glare. I've got to hold my own here. Swell up a little bit. You got a big fight coming up soon. I'm fighting for the IBO Super Middleweight world title. You want to score the most points, you want to win. You want to elevate your career, you want to become the best. It is a huge deal for me. getting ready to go at it. You've got a big fight coming up. about what might happen to you. We were playing New England, this was in the Super Bowl, actually. We were just wearing him out. Jumbotrons and they showed Tom Brady laying into his offensive line. As soon as we saw that, we were like, this game is over! the whole team and they're not going to play as hard any more. you start to lose focus on what you do well. When I'm fighting and sparring. going to act towards you, just from looking into his eyes. don't let him feel that, because that can give him an edge. I'll sit and fight anybody, ever. One of me and the guys, and send it to me, yeah. There were some interesting moves there. In case you didn't know, I'm also the greatest boxer. The greatest boxer you've ever seen. Do you know what, you wouldn't have known it from watching that. I caught him a couple of times. Brady and Belichick in particular? and they know exactly what they're getting into. And they know exactly how to handle themselves. They have a vast amount of experience to be able to pull from. for the Atlanta Falcons in that regard. We're forgetting about Dan Quinn. I mean, he's been there. of thinking that he's always been. But then each player is responsible for their own mentality. That's true, but he can tell them, this is where you need to be. It's all about your leadership. get your mind right, that's helpful. into your second Super Bowl compared to your first? We were a lot calmer. I can tell you that. team, believe it or not. in 2007 were still there 2011. We went in there, really calm and we just enjoyed ourselves. And you are more ready for the bedlam that comes with it. that is around the Super Bowl. when you get over there. But what the teams will do, is they kind of isolate you from that. And you can't actually escape media day, can you? or rugby where just the odd player will be put up to do the interviews. The whole team are put in a room and the media are let loose on them. you know, I think the guys like it. It's their day. They've made it. It's their time to kind of celebrate before the game. And, "Look at me", you know. But after that, it's all work. at and talk about themselves? Yeah... Believe it or not, I did. I actually got fined for not going to one of the media days. I went on Monday, and on Tuesday we were supposed to show up. I didn't show up, I was like, "I'm not doing this". "I'm locked in, Mark, I want to win". This happened. This really happened. Because, back then, I wasn't the type of person I am now. I was much more serious, Mark. booked their place in the Super Bowl against the Pittsburgh Steelers. In the AFC Conference Final. Let me talk about the Patriots here. the Texans in the previous round. they didn't do the things they were accustomed to doing. And so they came out and said, "You don't believe in us? We're going to show you". And they smashed the Pittsburgh Steelers in the mouth. Outstanding game by the New England Patriots. it let them fix flaws they had defensively. and that's what the Patriots do. They always get better at their weaknesses. Before we go back to the Patriots. Le'Veon Bell was out for the Steelers. player he is for them. No excuses, there's no such thing. I mean, people get hurt in football. but no one cares about that. You've got to get the next guy in to plug in and play. And that's the reality of the situation. Their fans will care about that. I mean, he is one of three players that they wouldn't want to lose. Antonio Brown and Roethlisberger being the other two. Listen, when we were talking about it, it was all about those three. and they said, "You're going to have to beat us in the run game". Well, the best runner in that game went down and got hurt. And you saw it significantly change after that. Who's the best tight end in football? Yeah, yeah, you know, that's one guy. Did you hear the New England Patriots make one excuse? But they had a chance to adjust. Even after he got hurt? When he first got hurt, they had issues. Did you hear them make one excuse? What did Bill Belichick say? The Steelers didn't have any excuses either. To be honest, what does he ever say? He's like, we're onto the next game. That's what was going to keep that offense involved. What I'm try to tell you is, there's no excuse. There's no excuses in football. the Patriots have been without Gronkowski for a while. in practice in the week. Le'Veon Bell went during this game. Bell missed the first four games of the season. DeAngelo Williams, what did he do? Was born the best running back in football when Bell got hurt. And you've got to block differently for Bell. Because the offensive line knows how much patience he has back there. The holes kind of operate differently. You know that with two different runners. We're going to agree to disagree on this one. But that's also true because they aren't a soap opera. They just get on and do the job. This is true. He's magic. I mean, the guy gets the ball out. He's always prepared. He has so much experience. This is like a practice for him, he's been in so many Super Bowls. And you just can't make that up, you know. 14% of all Super Bowls. That is, quite frankly, ridiculous. and they've won a majority of them, man. And they keep on getting it done. How will Atlanta try to stop LeGarrette Blount? if you let him get a full head of steam, he can run people over. of talent on their team. Tough, tough physical guy, runs between. And this is what the Patriots like to do. the top with the pass. They keep you off balance. You don't know what they're going to do with their personnel. You don't know what they're going to do at any point in time. And that's what makes them such a dynamic team. So is he a more cerebral wide receiver? that you have to be a very cerebral player because anything can happen. When you move and change positions. They knew this guy had what they needed. This is the thing that gets me with New England. that come to their team and excel. I mean, Chris Hogan was a guy who was bouncing around the league. getting two touchdowns, 180 yards. I don't know how they do that, man. but even they can appreciate a Championship win. It's all about the players. We've got great players they work hard, they're unselfish. And all these fans got to see it today. thing again in two weeks. It's mental toughness, man, that's what it's all about. And this team's got it. It's going to take a big effort. We need a couple of weeks to prepare because we're playing a great team. It's going to be a hell of a game. You played some football in Houston. You were at the Houston Texans. So when we are in Houston next week, what should we expect from Houston? The ground first of all, the venue. It's an amazing stadium. It's a state-of-the-art stadium. The people in Houston love football. And there's going to be some great food. That's what I'm excited about. Right, you'll eat well, then, we've got that from it. and an outdoor Super Bowl? because everything is controlled and you play so much faster inside. Usually a quicker playing surface. you feel they are right on top of you screaming, yelling. And I loved playing in that kind of environment. Super Bowls favour teams who normally play in outdoor arenas? I would think so, but remember, this is a retractable stadium. So we don't know if it's going to be closed or open. stadia is like plural for stadium. I thought it was stadiums. You need to e-mail me a nice list. This is like an education process for you two. Right, so Houston is one of your favourite stadia? It is one of my favourite stadia. Who surprised you this season from a team perspective? I don't think anybody saw them being at this point right now. after starting off 5 and 0.
all the way through, played outstanding football. I agree with that, but I'm going to take the Dallas Cowboys. I mean, watching those young guys play, who knew? And they're going to be dangerous next year. give me a team to look out for next season. yet, and who knows what might happen in the offseason. I'm going to stick with Dallas. Because I think they can go out, and we've talked about this before. really get after a quarterback, because offensively they're set. Watch out for the Cleveland Browns. I said it here first. Did you see how he just slipped that in, "You did"? Why am I watching out for them? What are you expecting them to do? I'm expecting them to be better. they were competitive in a bunch of those games. that they lost this year, they're going to win next year. And Hue Jackson is a fantastic coach, man. Next year Cleveland will be better. Well, that's it from us in the studio. Do you know what the plural studio is? So next Saturday we won't be in the studio. We'll bring you the Super Bowl preview show from Houston, Texas. And to everybody here in this studio, we'll see you next year. Thanks for putting up with us. Are we going to have fun tonight? We're going to have to send you to acting school. I'm going to build a wall between me and J Bell. It's going to be the best wall you've ever seen. And you're gonna make me pay for it? I'm going to make you pay for the wall! That's right. Welcome to the United States of Osi. For some reason, Mark, I just find myself being always right. Some of the greatest the world has ever seen. computer when my wife walks in the room unannounced! It was NFL.com, I promise! He came out of there like he was in the force. That was a great save. Can I come with you now? I'll stop talking bad about you when you're not around. It's OK, man, it's OK.
You guys... We ended that on a high. 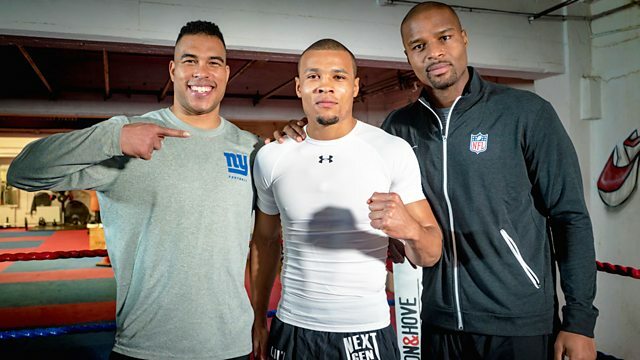 Mark Chapman returns with Super Bowl winners Osi Umenyiora and Jason Bell for an NFL season highlights review in the lead-up to Super Bowl 51 in Houston, Texas. The boys also take a trip to see 2016 British middleweight champion, Chris Eubank Jnr.